Boys from King Edward’s School, Birmingham have discovered that fundraising can be an illuminating experience through a charity event they held for Birmingham Children’s Hospital. 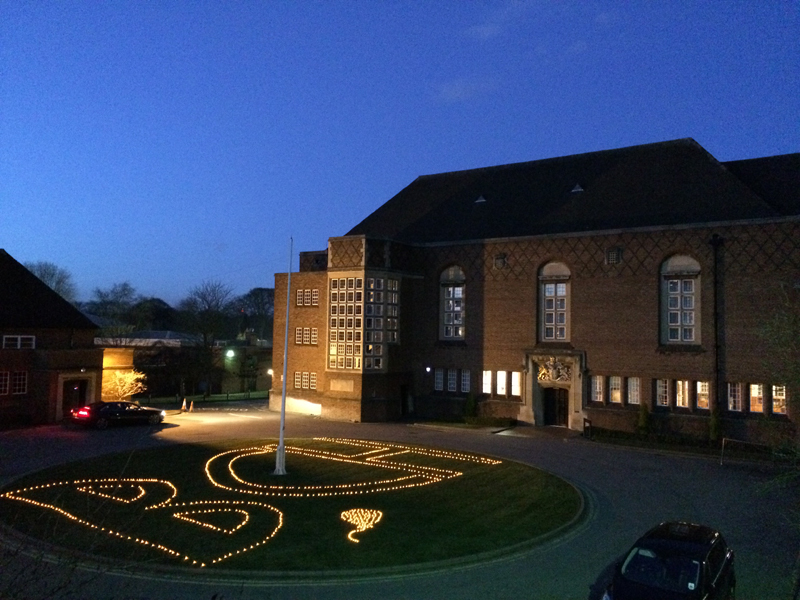 The ‘Illumination Day’ on Tuesday, 24 March 2015, involved boys at the School sponsoring LED candles which were grouped together to form the initials of the hospital outside the School’s main entrance. Boys paid a minimum of £5 to sponsor a candle and the Illumination Day has already raised over £5,000 for the hospital. King Edward’s School has been a longstanding supporter of Birmingham Children’s Hospital, initially setting up a cot fund in the late 1800’s to buy new beds for the hospital. The money raised from the Illumination Day will fund fibre optic lights to make the stay of young patients at the hospital a more pleasant experience. Working with the local community and charitable activities are central to the ethos of King Edward’s School. An element of the International Baccalaureate (IB) Diploma that all boys study in sixth form incorporates this ethos through the Creativity, Action and Service (CAS) programme, which the sixth form fundraising team’s work will also provide credit towards. Other activities that the boys will be organising to raise funds for the hospital include a bow tie day, non-uniform days and several raffles.